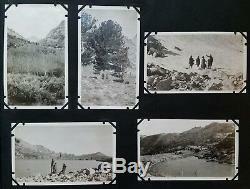 ANTIQUE PHOTO ALBUM WITH 145 PHOTOGRAPHS. 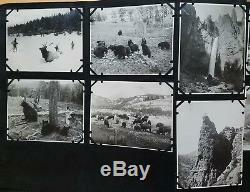 FEATURES: Native Americans (8), geysers, waterfalls, landscapes, children dressed as Native Americans (including one of a woman taking a photo of 2 of these children), animals (including a phenomenal shot of 2 standing bears), a fire disaster (2), and family shots. 142 photos are on the first 28 pages (14 double sided). There are 68 remaining blank pages (34 double sided). 12 of the photos have been glued down. 130 of the photos have been affixed with photo corners - most of these are affixed pretty securely, but if carefully done, they can be removed. As mentioned above, 3 of the photos are loose. Some of the photos are commercial images with captions. 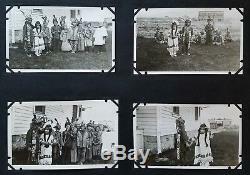 1 of the Native American photos is included in this group. 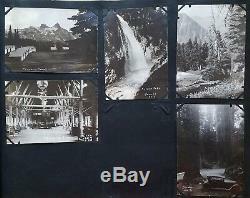 13 of the photos are Real Photo Postcards (RPPCs). 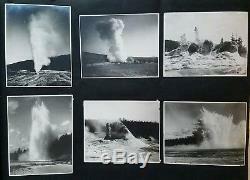 7 of the Native American photos and the 2 fire disaster photos are included in this group. 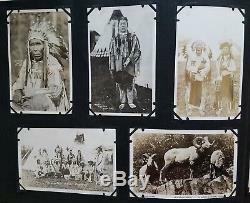 6 of the Native American photos have captions: "CHIEF TWO GUNS WHITE CALF, " "Blackfeet Indians, " "CHIEF THREE BEARS, " "CHIEF - TWO-GUN WHITE CALF, " "BLACK FEET INDIAN POW WOW, " and Blackfeet Indians Glacier National Park. 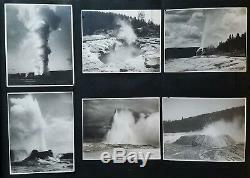 Photos range in size from approximately 2 1/8 x 2 inches to approximately 4 x 7 5/8 inches. The entire album is approximately 11 1/4 x 15 1/4 x 1 inches. 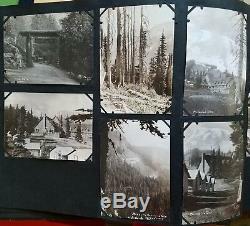 12 of the photos are not fully affixed to the pages due to corners coming undone. As mentioned above, 3 are completely loose. There is some mirroring to the group. There are only a few photos with NOTICEABLE condition issues: 1 has been creased and bent, 1 has a crease at upper left, 1 is missing a corner, 1 has wear along right edge, 1 has a tear at right edge, 3 have fading, 3 have discoloration, and only a handful have soiling. Again, that list is for more apparent and noticeable issues. There is minimal wear to the majority of the group. OVERALL, GOOD TO VERY GOOD CONDITION. Clean and well kept album. Overall, very good tones and details throughout. 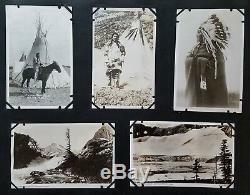 The item "YELLOWSTONE PARK ANTIQUE PHOTO ALBUM NATIVE AMERICAN INDIANS GEYSERS BEARS MORE" is in sale since Tuesday, January 22, 2019. 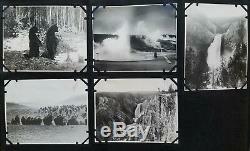 This item is in the category "Collectibles\Photographic Images\Vintage & Antique (Pre-1940)\Photo Albums". 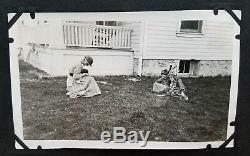 The seller is "genest" and is located in Jamaica Plain, Massachusetts. This item can be shipped worldwide.